Miranda Evarts remembers lying in her bed on a March night two years ago, unable to sleep. So she let her mind wander and found herself thinking about queens — not the fancy queens of real life, but silly queens that live only in the imagination of a 6-year-old. The Starfish Queen, the Rose Queen, the Pancake Queen. As Miranda lay there thinking, she realized that her queens had a problem. They were sleeping and needed to be awakened. Miranda bolted out of bed and ran into her parents’ room. “I made up a game,” she announced. Her parents tucked her back into bed and she finally did fall asleep. But a dream and Sleeping Queens had been born. Starting this month, kids all over the country can play Miranda’s game because Gamewright, a Massachusetts company, has made Sleeping Queens its first kid-invented game. But before Sleeping Queens got sent to the game company, it was an Evarts family project. Miranda’s earliest version had four sleeping queens that needed to be awakened by kings. The family — including mom Denise, older sister Madeleine and dad Max — first tried to play by drawing over the characters on a regular deck of cards. They soon found they needed more than four queens. So Miranda, Madeleine and Mom came up with the Peacock Queen, the Cake Queen and the Sunflower Queen. But Miranda’s idea involved more than sleeping queens and silly kings (the Bubblegum, Turtle and Chess kings, for instance) who wake them up. She came up with other cards that can put queens to sleep or let players steal them from one another. 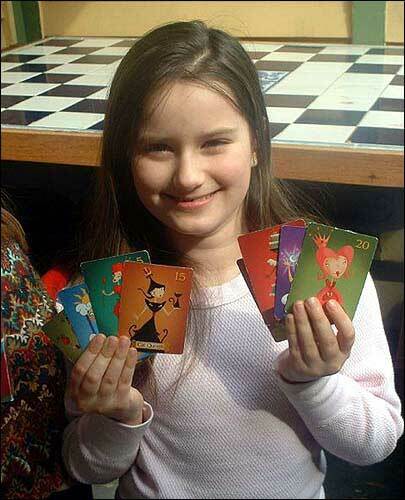 MIRANDA EVARTS, of Milford, N.J., came up with her Sleeping Queens card game two years ago. It is the first kid-invented game published by Gamewright, a Massachusetts company. Finally, Denise Evarts e-mailed Gamewright with Miranda’s idea. “I wanted to show the kids what you could do if you had a good idea and followed through on it,” Evarts said. Jason Schneider, who is in charge of picking new games for the company, liked the idea right away. “The Pancake Queen sold it to me. It spoke to my stomach as well as my heart,” he said. Gamewright gets several hundred ideas for new games each year, Schneider said, but makes only six to eight of them. “The best games are created the way Miranda’s was, with a bunch of friends playing it together,” he said. The company made some changes to Miranda’s game, including hiring an illustrator to draw the characters, but “we did our best to represent Miranda’s vision,” Schneider said. And how did Miranda feel when she heard that the idea that came to her on a sleepless night would be turned into a real game? “I jumped up and down,” she said. ¢ To win the game, you need to wake four sleeping queens or get 40 points (each queen has a point value).¢ Miranda’s favorite is the Rose Queen. She’s worth just five points, but if you wake her you get to wake another queen.¢ No player can have the Cat Queen and the Dog Queen at the same time because they fight like … cats and dogs.¢ A knight card lets you steal a queen from another player. But a dragon card can stop the knight.¢ A sleeping potion card puts a queen back to sleep. But a wand card can stop that from happening.